Most puppets share some characteristics with humans, but to make a human-like puppet, you must mimic humans more closely. A human-like glove puppet will do the trick, but you can also make marionette puppets, rod puppets or puppets that use more elaborate mechanisms for movement. 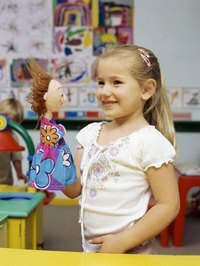 Puppets are invaluable for education and entertainment. Think about what your puppet will be used for and find a person after which you can model your puppet to aid in the design. Make the head of your puppet. Blow up a balloon until it is as big as you want your puppet's head to be. Cut a newspaper into strips that are 2 inches thick. Mix 2 cups of flour and a half teaspoon of salt in a bowl and add enough water to give the mixture the consistency of pancake batter. Dip the newspaper strips into the mixture, allow the excess to drip off and then lay the strips over the balloon, leaving the bottom of the balloon, where the knot is, uncovered. Later, this is where your fingers will go into the head. Leave the paper mache to dry overnight. Repeat until the balloon is covered with three layers of paper mache, leaving each layer to dry overnight. The face should take about four days to make. Choose one side of the balloon head to be the face of your puppet. Dip new strips of newspaper in the flour mixture. Press the damp newspaper strips together to form eyebrows with sockets for the eyeballs, then form a nose and a mouth. Roll two strips of newspaper into balls that will fit into the eye sockets. Use your palms to roll the paper mache newspaper strips into balls. Rub your finger over the surface of the balls to smooth them as much as possible. Set them and your completed face aside to dry overnight. Paint your head with flesh-colored paint after the paper mache has dried. Use acrylic paints, which dry easily. Paint the eyebrows the same color as the fur you will use for the hair. Paint the mouth red. Paint the two eyeballs white and leave them to dry. Paint a small colored circle in the middle of each ball. This will be the iris, so it should be blue, brown or green. Paint a small black pupil in the center of each colored ball. Put two small dots of glue on the back of the eyeballs. Use the hot glue gun sparingly. Press the eyeballs into the eye sockets and leave to dry. Cut the fur to size with the scissors and paste it to the head with the hot glue gun. You can paste the fur in the shape of the hairstyle you want your puppet to have. Leave to dry. Place a glove on your dominant hand. Your thumb and pinky fingers will be the puppet's hands. Push your three middle fingers up through the hole in the bottom of the puppet head. Lift the head off. Put hot glue on both the glove and the puppet head at the points where the two meet and push back into position. Leave to dry. Decorate your glove to look more like clothing. You can use markers or add a bow tie or tie around the puppet's neck. You can sew a dress for a girl puppet or put doll's clothes onto the glove body. For long hair, use yarn instead of fur. Cut long strands of yarn and paste them to the puppet's head, then style into braids, pigtails and other long hairstyles. You can mold the head from clay if you want more detailed facial features. Use air-drying clay, as it is lighter than polymer clay and can be painted with acrylic paint. Add a hat or make small glasses out of wire. You also can use props for your puppets such as doll accessories. School of Puppetry: What are Glove Puppets?